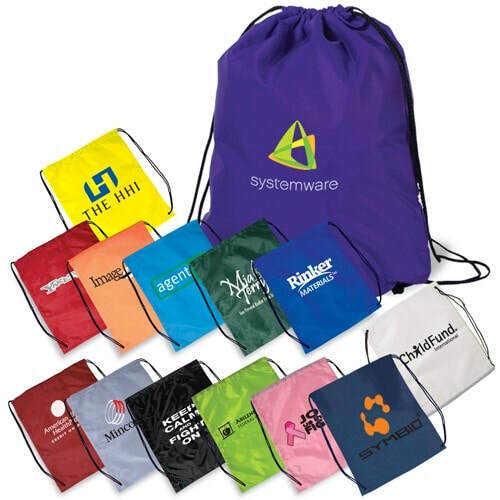 In the promotional bags category, custom logo promotional String a Sling Backpacks are a top seller every year, and it's no wonder that these customized drawstring backpacks are an ongoing hit. These String a Sling Backpacks arrive at your door printed with your one color company name or corporate logo, or even your school mascot! The String a Sling backpack is a 210d polyester cinch style backpack and can hold up to 24 lbs of your stuff! We've seen these personalized logo string a sling backpacks used for sports tournaments, football booster clubs, 5k giveaways, and more! After ordering send your art, bag color, and imprint color to sales@adspecialtyproducts.com or ask us to assist. - Pricing is all inclusive below!